Epson lives up to market requirements by its Stylus Dx8450 which is a state-of-the-art printer capable of producing high-quality documents and photo prints. The maximum printing resolution is 5,760 x 1,440 dpi which looks good on paper and produces great photos. The scanning resolution goes up to 1,200 DPI x 2,400 dpi. Epson Stylus Colour Dx8450 ink cartridges produce high definition prints and lively colours which along with printer’s quality makes printer suitable for amateur photographers. The printing speed ranges from 29 ppm in coloured printing to 32 ppm in monochrome printing. This printer has dimensions of 17 inch in width, 13.4-inch depth and 7 inches in height. The weight of printer is approximately 6 kgs. The printer has an input tray of 120 papers of maximum A4 size and a dedicated output tray. Epson Stylus Dx8450 can connect through USB along with PictBridge technology for direct printing from camera and memory card reader. The printer has a dedicated photo printing option. This printer operates on 4 ink containers one dedicated to black. LCD screen helps in an easy and smooth communication of printer and user. Epson Stylus Dx8450 is an all in one printer suitable for home, small office setups and amateur photographers. With the Epson Stylus Colour Dx8450 ink cartridges and high-quality prints offered by a printer, the photos result to be lively and bright. The moderate size of the printer makes it convenient to operate at home. The LCD control, PictBridge technology and memory card reader make this printer easy to use and connect to. Q. I am dealing with the printer for the first time. Does this printer provide user-friendly interface? A. Yes, this printer has user-friendly interface and is an all-in-one solution for printing, scanning, and copying with colour display. It has lived up to its market requirements and is a state-of-the-art printer, capable of producing high-quality documents and photos. With fast printing speed, it has set its mark in producing high-quality printouts. The interface of the printer is simple and suitable for home, small office users. Q. Will I get the same number of printouts from the compatible Epson Stylus Colour Dx8450 Ink Cartridges as I get using the original cartridge? A. Yes, You will get at least the same number of printed pages from compatible Inkjet cartridges as you will get from an OEM Inkjet cartridge. In some cases, it has been noticed that the customers are getting more printed pages than using the original Epson Stylus Colour Dx8450 Ink Cartridges. Q. What type of paper will you recommend to use for printing from Epson Stylus Colour Dx8450 printer? A. We recommend you to use Photo paper (glossy) or Value glossy photo paper for printing photos or other coloured documents. Q. Do I need to replace all the ink cartridges together if my one cartridge is empty? A. No, Due to the separate individual ink cartridges you do not need to replace all the Epson Stylus Colour Dx8450 Ink Cartridges together. This also makes it very good value for money. Q. 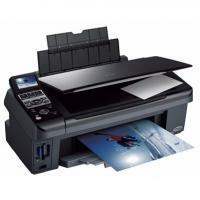 Can I use Apple AirPrint With Epson Stylus Colour Dx8450? A. Sorry, the Apple AirPrint feature is not applicable to this printer as it lacks in networking capabilities. Q. Will there be any problem if a new Epson Stylus Colour Dx8450 Ink Cartridge remain outside the printer for an hour after I open them while replacing? A. A new cartridge can be kept in the open for up to 30 minutes at the most to prevent them from drying out. For good performance of the printer and the cartridges, it is recommended to carry out the replacement procedure as soon as possible without much delay.